AJ1 Builders - Builder based in Warfield, Berkshire. 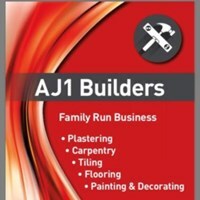 Aj1builders is a dedicated team of builders run by myself Adam Plummer. We cover many aspects of building work including: plastering, brick laying, plumbing, kitchens, bathrooms, renovations, carpentry, roofing, patios, fencing, outbuildings, house and garden renovations, extensions, widow fitting, fasciae and soffits, RSJ installation, flooring, painting and decorating, tilling, and all other trades inbetween. We are fully insured and pride ourselves on a high standard of work. I have great communication skills and love to work hand in hand with my customers to achieve exactly what they desire. I offer free quotes and if you are interested then you can email or phone me and we can organise the best time and date for us both to come around and have a look at what you want to achieve and then get a quote emailed over to you. I like to project manage my jobs and take away the stresses from my customers of all the building work, materials etc. This doesn’t mean you will be kept out of the loop just that all the unfamiliar situations you may not be used to in the building trade I will handle and explain with you throughout the project. If you have any questions then just call.